Gone are the days when Ireland were the jovial interlopers on the big stage. The kings of Associate cricket have qualified for every major tournament since their headline-making debut at the 2007 World Cup. Ireland relish mixing it with the world's elite and the boys in green are no longer content to play the role of plucky losers. Sri Lanka's capital Colombo is the venue for their World Twenty20 opener against Australia on Wednesday and a meeting with the West Indies five days later. The Irish sense vulnerability in both opponents - Australia's recent malaise saw them fall behind Ireland in the T20 rankings while the erratic Windies can produce both magic and mediocrity. Ireland all-rounder John Mooney, who misses the tournament because of a thumb injury, believes the Group B underdogs can spring at least one surprise. "We can definitely make the Super Eights stage. We have a talented, settled squad and and most of the players have plenty of experience at this level," said the Dubliner. "The Aussies are not the side they were but they always have a strong, winning mentality so they can never be discounted. "The Windies have bags of talent although when they play sides like us they often have an arrogance about, which we can take advantage of. "We can't match these sides if they are at their best, but Ireland can cause an upset if they have a bad day and that's a real possibility." 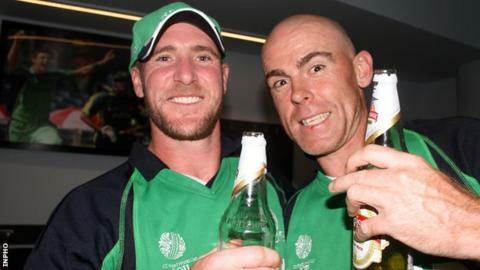 Big-hitting duo Paul Stirling and Kevin O'Brien are potential match-winners while captain William Porterfield, former England batsman Ed Joyce and Niall O'Brien are classy accumulators. Somerset spinner George Dockrell comes into the tournament on a high after signing a new county contract and being named as the ICC Associate and Affiliate Player of the Year. There's accuracy and economy from Trent Johnston and Alex Cusack while pace and bounce comes in the form of Warwickshire's Boyd Rankin. "We have a well balanced line-up and the team's main strength lies in our fielding and bowling," insists Mooney. "George Dockrell is undoubtedly a star of the future and he will be a key player for us in Sri Lanka. "Alex Cusack produces some fantastic yorkers and has a great slower ball while Trent Johnston keeps producing the goods. "Obviously the batting is also crucial but only by restricting the opposition can we hope to win games." Test status is Ireland's ultimate goal and with each tournament come debates over their suitability for the five-day arena. Rankin will soon join Joyce and Eoin Morgan in making the switch from Ireland to England in the hope of playing Test cricket. "You can't blame Boyd for making the move although he is injury prone and I'm not sure if he will make the England team," said Mooney. "We are making strides in domestic cricket with the introduction of an interprovincial series and the increasing professionalism of our set-up. "Ultimately it comes down to whether other sides want us to have Test status, regardless of how we perform. "We can only show that we can be competitive in the tournaments we play in and I expect we will do just that in Sri Lanka."